Hiring a professional and experienced wedding photographer will guarantee you top quality photos and a ton of creative ideas for your wedding shots you will be inspired by. 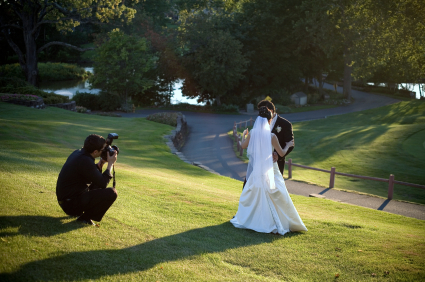 This, however, doesn’t mean that you can’t share your own original photo ideas with your wedding photographer. It’s really heart-melting to see different generations in one shot. You can set your imagination free, but it’s a good idea, for example, to include a shot of the bride with her mother plus a small girl (the flower girl will surely be more than happy to participate in this shot). The ring bearer (if he is a boy) will probably be thrilled to participate in a photo with all the groomsmen as well! On this very special day, it is all about the love between you and your husband. Why not incorporate it in the shape of a heart in some of your wedding photos? You can form a heart with your hand and the hand of the groom. Or you can pose in a heart-shaped “circle” of all your wedding guests! This is a very cute idea for all those “shy” newlyweds who want their privacy when giving each other those sweetest kisses after the ceremony is over. Ask all your guests to cover their eyes while you “make out” or, better yet, arrange all the little ones beside you (flower girls and ring bearers) and make them cover their eyes while you kiss the groom with their giggles in the background!